Cultivating Inner Peace was written to animate in readers a myth of possibility, to inspire through captivating biographical images, to evoke sympathetic realignment rather than to convince. The people whose stories are told in this books do not represent spiritual homogeneity. They can’t necessarily be considered on the way to mystical union; nor are most them on the direct path to Nirvana. Representing diverse levels of attainment of inner peace, most aren’t perfect examples of the entire process and are often emblematic of only one or two aspects. As Christians, Hindus, Jews, Buddhists, Transcendentalists and atheists they had different philosophies or theologies and were riding on different conveyances, but all of them camped for a year or a lifetime in the pinewoods of peace. No mere ideology can cup it, because the cultivation of inner peace is the activation of an atmosphere. 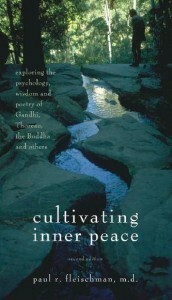 Exploring the psychology, wisdom and poetry of Gandhi, Thoreau, the Buddha and others. Written by: Paul R. Fleisxhman,. m. d.